On Friday, April 7, 2017, StrongMinds marked World Health Day at the World Health Organization’s event at the United Nations in New York City. StrongMinds was joined by other local, national, and international nonprofits working in the global mental health space, as well as academic partners from the New York City area. 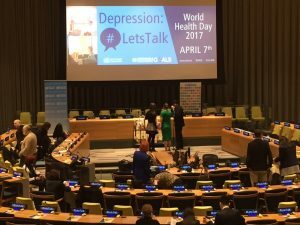 The theme of this year’s World Health Day is Depression: Let’s Talk. The goal of the one-year global campaign is to have more people with depression seeking and receiving treatment. A better understanding of depression will help reduce the stigma associated with the condition, and lead to more people seeking help. The event was moderated by Dr. Nata Menabde, Executive Director of the WHO office in New York City. There were two panels, one high-level opening segment followed by an expert panel discussion. Click here to read the opening remarks from H.E. Ms. Dessima Williams, Special Adviser to the President of the 71st Session of the General Assembly. 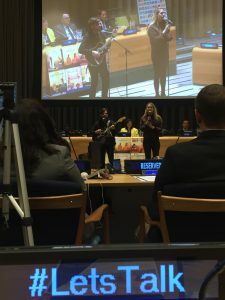 In addition, there was a musical element with Dr. Yasmine Van Wilt, award-winning singer-songwriter and advocate for mental health, singing a few songs about struggles with depression. Click here to watch the entire event online. The Depression: Let’s Talk campaign continues with additional events, outreach, posters, and on social media with the #LetsTalk hashtag.